Hearts for Hearts dolls announced on Facebook that they are re-releasing Shola and Mosi. This is nice news. I do love Shola, but I already have her. 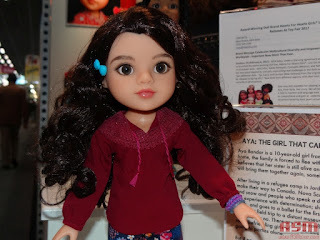 Mosi is cute, but it is weird and uncomfortable how they first planned to make her Navajo with permission from the tribe (which is illegal) and when this was pointed out to her she was marketed as generic Native American. But the news I reaaaally want to hear is about Aya, the really adorable Syrian doll they showed at Toy Fair in 2017. Here is the blog post I wrote about her last year. She is adorable, her story is great, and I want two, one to be Aya and one to be her twin. Hearts for Hearts said at one point that she would be released in February 2018... which did not happen. I have not been able to find any pictures of her at the 2018 Toy Fair. Where is Aya? I want her! I would also be extremely happy to hear that Surjan has been scheduled for re-release. She's probably the top one I want among the dolls that have already been released.